Finally back here in Paris, and seemingly fitting that I should finally be able figure out the Internet on the last day of the first month of the year, I wanted to post the New Years video I made, which stubbornly wouldn’t upload for 31 days no matter what I tried. He introduced us to the crazy traffic of India. We were completely amazed and yes, a little bit freaked out by the amount of cows on the road, the honking and overall chaos. He stayed quiet and friendly for the entire time that we were adjusting to this new way of transportation. After the first week we moved and did not need him to drive us around in his van anymore, but we kept in touch and he was the one I would call when I needed a cab to Pondicherry. He became less quiet and even a good friend. A friend that even took me home from Pondi in a Riksja or on the back of his motorcycle. By that time my fear on the road was almost completely gone! When I told him I was feeling sick he invited me to his house where his mother made me iglys and dosai. We even had drinks on a rooftop and talked about his life in Kullampalayam, the village where we stayed and where he grew up. When he told a friend and me about his love life, I realized, again, how privileged I am. I wanted to relate to him, but I couldn’t. He told a Romeo and Juliet love story. He showed us pictures of this girl that he was so deeply in love with. She looked a bit shy at us from the picture on his mobile phone. They couldn’t be together he told us. At first, we refused to believe that. ‘Why not? Just run away with her!’ We told him. His father said that he would kill himself if he would marry this girl, and he believes it. To marry a girl here, first, the families must get along and love comes second. He told us he could only be friends with this girls now. The families hated each other. Whenever he calls her, her mother would pick up the phone. He tried to smile, but we could tell he was sad just talking about her. He called her and when he finally reached her Jamie talked to her briefly. She was just as shy as him and talking to her made us realize how painful the situation is. In our world ‘love’ is something that is a right, that is there, something that just happens and we go with it. It is seen as a setback when the families dislike each other, but if people really love each other, those problems can be overcome. It became clear that this isn’t the case here and the contrast between our two worlds seemed bigger then ever. The fact that there is this problem without a solution, while it could be so easily solved in my country makes it almost impossible for me to relate to him. It is a different country with a different culture and everyday life and its structures are not like ours. For a moment I hated it, but afterwards I realized that somehow, I do love this place. May be that is how my friend Naga Raj feels about the situation. He hates the situation but he sincerely loves and respects his family and the traditions that are attached to the place where he grew up. I just hope that, in the end, he gets what he wants. I would like to share with you what I experienced last Sunday. In the village of Periyamudaliarchavadi, the organization EcoPro that I have been volunteering with made a clean-up together with the locals, removing all the garbage accumulated on every spot that people considered enough out of sight to dump heaps of waste on. After the clean-up, all the women were invited to participate in a Kolam Competition. Kolams are the beautiful artworks that women usually paint outside their houses to welcome guests and keep away evil spirits. This time the kolams were created to keep away the litter. When everybody had gathered around, EcoPro took the opportunity to thank everybody for cleaning up the village, and to talk about the importance of not just dumping garbage and burning it on an open fire, but instead collecting it and recycling it. Then followed a nice ceremony of announcing the winning kolams and giving prices to the women. Even though I don’t speak a word of Tamil, it was clear to me that this was a well appreciated event – because I could see all the smiles on the women’s faces and recognize the attentiveness with which they listened to the presentation. I had an inspiring experience. For me this showed a good example of how one can launch a development project and engage the local community to participate and enjoy it. Now I hold my fingers crossed for a cleaner, more beautiful Periyamudaliarchavadi. I have been spending a lot of time with Biggie, a woman who works at the Botanical Gardens. Biggie is a small, energetic woman who always seems to have a purposeful bounce in her step. She moved here in ‘72, and helped build Auroville. 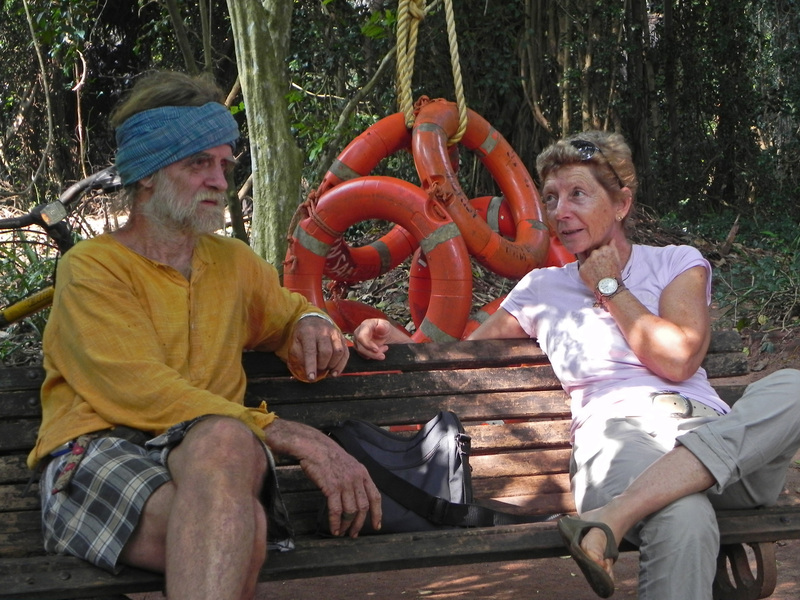 Although she has been back and forth between France, Germany and Santa Barbara over the years, she said Auroville is her home and she could not imagine living anywhere else. Biggie invited me to her home for tea and then took me to see some of her favorite parts of Auroville. I was pleasantly surprised by her home. She said she had it built 15 years ago. The arched, wooden frames of the doors and windows are made with the Acacia trees she planted in the 70’s and the walls are made from white, painted cement/dirt bricks that Auroville started using as a sustainable building material. The Acacia trees or what the Mother named the Work trees, are also very sustainable because they grow quickly. In addition to her house being sustainable because it is made from materials that are easily found (or that she herself planted years ago), she found Tamil boys looking for a trade to be trained in and paid them to help build her house to help them learn architecture and construction. She lives back a windy road off of the Green Belt that has a round boulder with her and her two neighbors names and arrows pointing in the directions in which they live. The Green Belt is the outer ring of Auroville which makes an effort to be completely sustainable. It runs on solar power and the water used is pumped by windmills. While I was with Biggie, she took me through what used to be called The Seven Banyan Forest because of it’s giant Banyan trees. She showed me one in particular that was next to a giant gorge they dig for drainage. 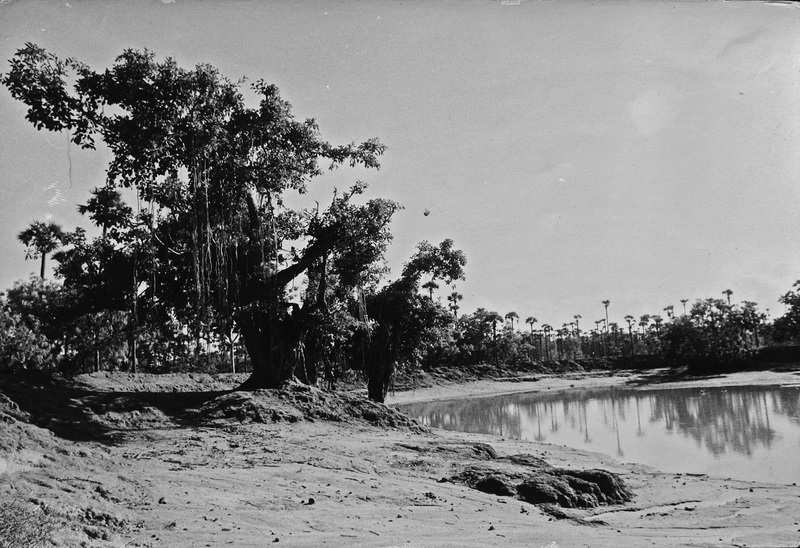 Later that day, she showed me the picture of the same Banyan tree when it existed alone in the red, laterite desert amongst a few Palmyras. Another picture she showed me from the beginning of Auroville was of Johnny, one of the first people to come to Auroville. 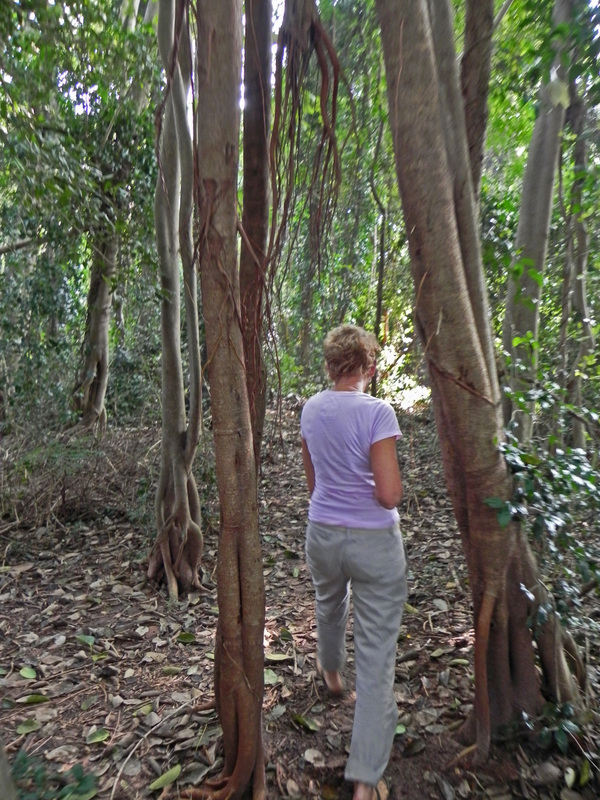 I went with her later that day to meet him and see the part of the Seven Banyan Forest he developed. Where Biggie lives appeared as more of a neighborhood with more clearings for the houses and defined roads; where Johnny’s area reminded me more of a camp only accessible by paths. Johnny told me how the Banyan tree had very tasty leaves for animals and doesn’t survive if it grows from the ground. Instead, the birds eat the leaves and carry the seeds to the branches of the other trees which is where the Banyans grow from. 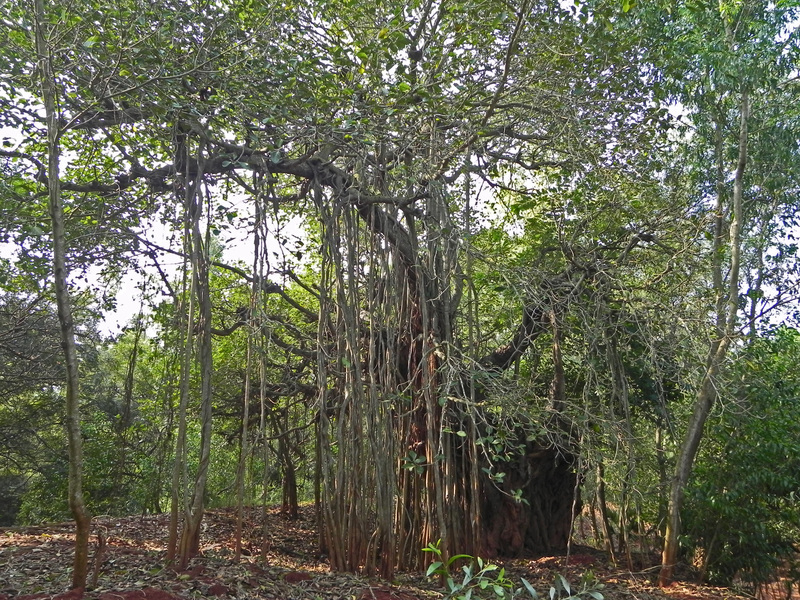 If you look closely, you will usually notice another tree, such as a Palmyra rooted in the middle of the Banyan tree. 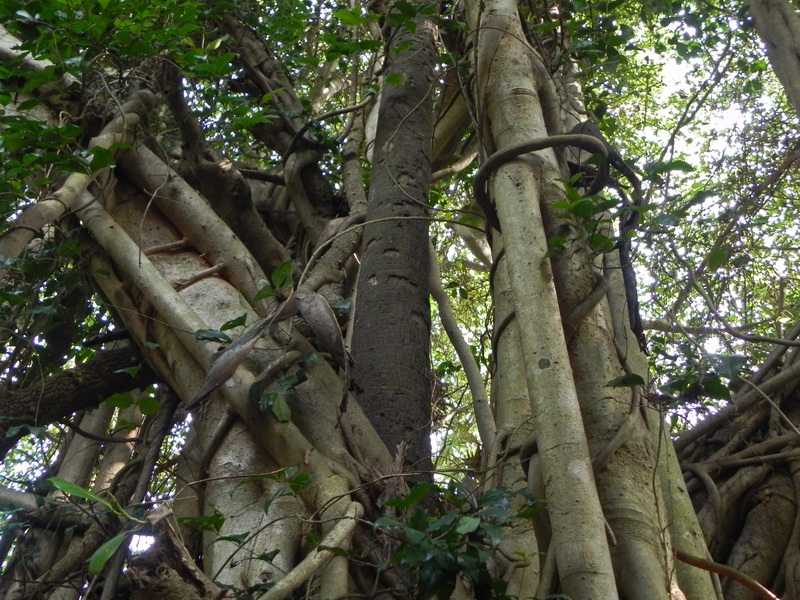 I asked Biggie why the Banyan tree had aerial roots and Johnny did not know, but one of the little girls running around told me it is so the branches can grow out further. I am thinking now that because the Banyan tree starts growing in another tree, rather than it shooting it’s roots into the tree it grows off of and potentially killing it, perhaps it has adapted to grow it’s roots down from the tree into the ground (but that is just a speculation on my part. Johnny’s son is building a house next to Johnny’s, which makes Johnny’s house look like a shack. I saw the inside and it looked like a house you would see in parts of California or Florida. It is a very large, solid house that has about five rooms and walls and ceilings that appear to be made from cement. The doors on the house have very intricate carvings in them, are two or three times as thick as a normal door and are made from very solid wood (which would be less sustainable because the solid wood takes much longer to grow than the softer wood of the Acacia tree). It was funny to see Johnny, who looked like he is a hippy straight out of the 60’s and then his son who is very well groomed. I am not sure what his son does, but he had just come back from Spain and brought a lot of high fashion magazines. The contrast between Johnny and his son reminded me how Paul, from the Botanical Gardens, said that it is not Auroville’s goal as a whole to be sustainable. Auroville is everything to everyone. To Johnny, it is more of a sustainable lifestyle where to his son, it seems to be a playground away from the Western world. On a regular morning in Kuilapalayam you can find village women walking together, water barrels atop their heads, headed for the community water tap. Men stand close together, chatting, arguing, watching passersbys. The street is hurried and frantic, with rickshaws (and AUP graduate students riding worn scooters) dodging cows, goats, oncoming farm equipment, and large passenger buses. Young school girls, their hair in braided pigtails with ends that have been tucked back into colorful elastic bands, giggle together as they walk alongside the morning madness. There is a buzz in the air, weighted by humidity, that is reminiscent of something known yet foreign. Morning village life demonstrates a sense of community, a detached closeness that binds together beings existing together in a small space. Community is ever-present here, in the daily rituals such as kolam drawing in the entryway of homes, as well as in the rituals surrounding death. . However, community is slowly falling apart here, according to Balasundaram (Balu) Ponnusamy, 31, a founder of the Mohanam Cultural Centre in Sanjeevinagar village, outside of Auroville. Up until the last few decades, small Tamil communities were relatively protected from the outside and villagers relied on one another to learn basic skills and cultural traditions. “People looked up to their elders, they listened to their wisdom,” he said. “If a woman had a problem, such as domestic fight, the neighbors, hearing the quarrel, would intervene and stop by to see what was going on.” Balu told me, however, that today villagers are more likely to call the police, or perhaps just turn a blind eye. This change in behavior has been the most dramatic in the last decade, he noted. Balu, who grew up in the village, sees a direct correlation between economic development and the change to community life in the villages. As Western influences seep into village life, people grow more focused on their individual needs and desires. Today, he said, it is common to find villagers at home flipping between the more than 200 channels of satellite television available to them or sitting alone sending text messages to friends kilometers away. Not that globalization is all bad, he noted. Western investment and development efforts have helped to improve the education system as well as improve health standards in the communities. However, influences from abroad have widely altered the way the villagers, especially the youth, view themselves in a global landscape. Balu added that as people begin to isolate themselves focus on their material needs, cultural traditions erode. Young people no longer look to the elders in their community for advice. Neighbors no longer take time to support one another through hard times. With the deterioration of community comes a weakening of common cultural knowledge, including the rituals and traditions that bind people together. One could argue that this shift is the natural progression of things–teenagers rebelling and seeking freedom from their parents. 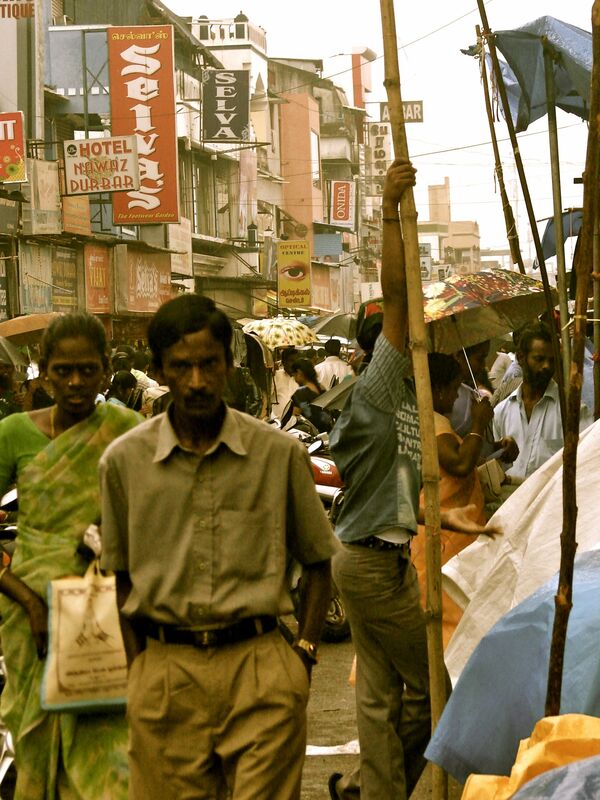 Yet, Balu views the impact that globalization has on his community as more threatening. As India becomes a larger player in the world economy, he questions what will happen to the communities he knew as a child. 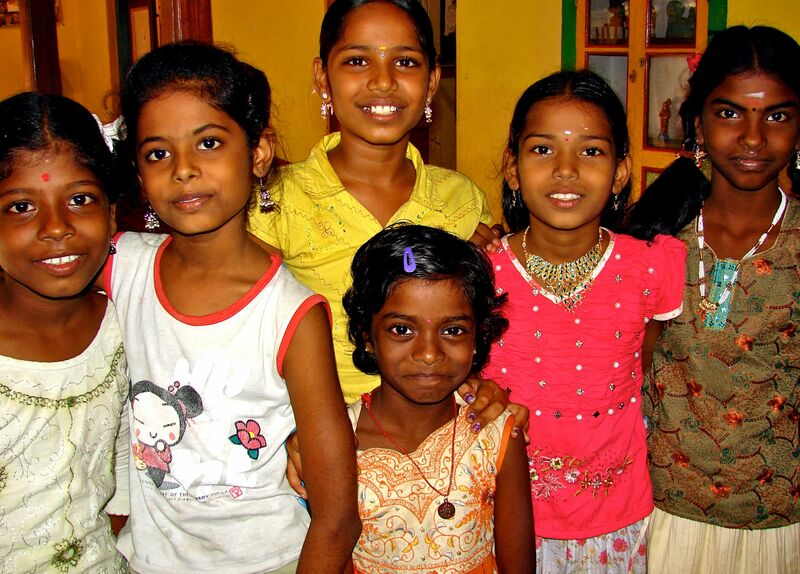 It is for this reason he created the Mohanam Cultural Centre, a non-profit organization devoted to inspiring creativity in village youth by teaching them traditional Tamil arts and crafts. Through this endeavor he aims to keep alive traditions and rituals that have held the local community for centuries. He also brings the children and teenagers on visits with the local elders, in an effort to share knowledge from one generation to another. Yet, as a Western student considering work in development, I am reminded to consider what influences I bring to communities I want to help. Does my very individualistic, market-driven take on life help or hinder the people with whom I work? Can I instead learn something important about human connectedness and interdependence? And if we are going in the direction of a global community, where do we find balance between improving ourselves and looking out for others?